Phuket has always had a window open to the world beyond. The Arab merchants were the first to master the difficult art of navigation which made it possible to cross oceans. Later in the beginning of the 16th. century Portuguese, Dutch, French and Brit showed up on the in the horizon from the white beaches. Only by coincidence it was Singapore and not Phuket, which became the major port of trade before the merchant ships returned to Europe with their valuable cargo. In good harmony with the original Thai traditions and culture, Phuket, has developed into Thailand’s favorite holiday destination. The vigorous thickly wooded mountain sides and the maritime beauty, surrounding Phuket and the nearby mainland has contributed to the modern human being daydreams of a tropical paradise. More and more foreigners from all over the world have settled in this area and have helped to create an international community, where modern standards of architecture, design and comfort are visible. Welcome to an exciting, glorious and sunny Phuket. SNORKELLING at the best coral reefs. Full day speedboat tour incl. lunch. KHAO SOK NATIONAL PARK. Rainforest & Gibbon calls. Nature lovers only. Honeymoon Island & Coral Island. Charter possible. PHUKET FANTASEA. Top professional evening show for all family members. ELEPHANT SAFARI Uphill through, rainforest & rubber plantations. JUNE BAHTRA & Suwan Macha. Chinese junk & the magic wonders. Over night stay possible. PHUKET ZOO – Not a traditional zoo! Crocodile, elephant & monkey show. A bit of it all. Discount excursions with JAMES BOND ISLAND. WKT058 KOH SAMUI Koh Phangan – Koh Tao. Full day tour by Speedboat or overnight. excursion boat. Overnight stay possible. Many possibilities at our special low rates. WKT060 KOH YAO NOI & YAI. Islands in Phang Nga Bay without mass tourism. Different style accommodation. WKT042 RACHA-RAYA ISLAND Coral reef to the shore. Accommodation possible, Bounty island south of Phuket. WKT057 – PARADI-ISLAND KOH LIPE. Speedboat from Phuket, Koh Lanta and Langkawi. Arm breaking fights with giants of the sea. Overnight stay possible. Flying fox in monkey height through the rainforest. GO KART – Speed it up on the coolest and biggest track in South Thailand. We tailor fit your Golf Packed. Sea Kayak. Kayaking people from around the world meet. Program 1-6 nights in Southern Thailand. Set sails among the vertical rock islands and coral beaches. Full day max 9 persons. 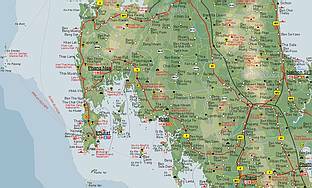 A+B PUBLIC BUS FROM PHUKET TO SAMUI, BANGKOK ect. Book time. Try to shoot with rifles, shotgun & pistol. Guidance of the instructor. World Famous extravagant & amusing Drag Show. Avoid parking problems – 25KM per litre. Become independent of taxis & public transport. THAI BOXING prizefights Mon & Thu. THB 1300 Ringside. Free pickup Kata, Karon, Patong. Phuket Jungle BUNGY - 50m fall. Strict requirements for safety. Rent Boat with crew. Start Phuket, Krabi or Phi Phi islands. Reasonable price. Charter a sailboat, speedboat or motorboat for the entire day or more. Excursions and Activities when staying in these places. VISA RUN applies to all foreigners residing in Thailand for long time. The Passport stamp indicates when it's time to go. WELLNESS. Individual Spa & Massage packages based on ancient wisdom and philosophy. GEMS GALLARY The Worlds biggest state owned jeweller's shop. Tips to tailor visits. Our skilled THAI TAILOR has his own workroom. Thai Cooking Class. Learn to make Thai food while you are here. Instruction of herbs and spices. Thai Optician MOVIE. Fashion in spectacle frames - Eye test. Cheap price on brand names. Dentist in Phuket. Up to date equipment. Whitening, Implant. Footwear, waistcoat, MC gear, belts. All created by hand - best quality. Phuket Cosmetically plastic surgery. Botox, laser removal of eye & forehead wrinkles. Fish foot massage. Sucking and sipping and remove all dead skin cells and damaged skin. Do you have a defect mobile phone? Bring it with you. They can fix it in Thailand at low cost. Resort & Hotel BOOKING. Communicate with a real person & expert. Let us find the perfect place. Many options. But if you want to save - ask WKT first. Our INN. Stay well & cheap with us in Patong. Views of mountains and temple. Stay in Phuket with the best excursion.